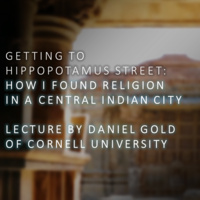 Join us for a lecture by Dr. Daniel Gold, Cornell University, Professor of South Asian Religions and chair of the department of Asian Studies. Dr. Gold is the author of Provincial Hinduism: Religion and Community in Gwalior City, a sprawling urban area where he lived as a Peace Corps volunteer from 1968 to ’73 and to which he returned as a researcher in the late 1990s. His talk will examine some reflections on how he carried out new ethnographical research on religion in a place where he already had some old religious attachments. The talk will be followed by a short film he made on religion in a working-class Gwalior neighborhood. This is sponsored by The Fund for the Study of World Religions, with support from the Religion Department.